CENTENNIAL, Colo. -- It was not the news that Arturo Hernandez wanted to hear. The Thornton business owner and father of two, who has lived in Colorado for 16 years, had requested a stay of deportation. On Thursday, ICE told him that his request was denied. "I was really sad," Hernandez said. "I want to stay here with my family. I need to stay her with my daughters and my wife." Hernandez came to the U.S. legally in 1999 on a tourist visa. He started his own business, a flooring company, and began raising a family. Jennifer Piper, the interfaith organizer for the American Friends Service Committee, said Hernandez was falsely accused of Menacing and Harassment in 2010 while working on a construction (tile) project. "He (the other contractor) wanted the tile folks to move all of the huge pallets out of the way, and they said, 'well the supervisor asked us to be here,'" Piper said. "That guy went and complained to the supervisor," Piper added. "The supervisor said, 'I'm not having them move that stuff, go hang windows somewhere else.' That person ended up calling police and accusing Arturo of threatening him." Hernandez was charged with felony menacing and harassment. That's when he got caught up in the immigration net. "A jury of 12 people in Douglas County found Arturo not guilty," Piper said. "Despite that, his deportation proceedings continued." Hernandez was ordered deported and then entered Sanctuary. "He was the first person to claim sanctuary in Colorado," Piper said. U.S. Senator Michael Bennet introduced a private bill to help Hernandez and asked U.S. Immigration and Customs Enforcement to give Hernandez more time to process his case. "Arturo has been a valued member of our community for nearly two decades," Bennet said. "As a business owner, he has contributed to our economy and has always worked hard to support his family. He should not be a priority for deportation. This is yet another example of this Administration's misguided immigration policies that do not align with our national priorities and values." Piper said Hernandez received a letter from Washington saying he was not a priority, so he left sanctuary in 2016. "In 2017, the new administration changed policies," she said. "ICE followed him, picked him up and detained him for several weeks." He was released to attend his daughter's graduation and was then given a two-year stay based on the bill that Bennet introduced in the Senate. "That stay expired last Friday," Piper said. 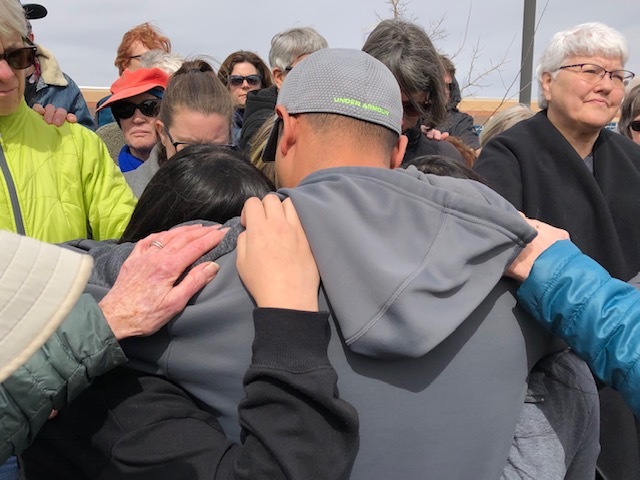 Family members, friends, and supporters from the faith community held a vigil outside the ICE Colorado Field Office Thursday. "We care about Arturo because he cares about his family and he cares about the community," said Tom Kowal, a friend and member of Mountain View Friends Meeting. "The system is irretrievably broken," Kowal added. "It has been harshly and cruelly applied by this administration to an important member of our community. It is breaking families apart." The Thornton tile expert and his wife are still waiting for a written explanation from ICE as to why they turned down his request for a stay of deportation. They worry what it will mean for their daughters. "If Arturo is deported, it would shatter their lives," Ana Sauzameda said. Sauzameda has been waiting for her U.S. citizen father's petition for her to come through since 1992. In November of 2018, Sauzameda's attorney filed suit against the U.S. government to correct a mistake made when they assigned her a priority date for processing her application. Piper said the lawsuit will likely be heard late this summer or early fall, and that if it is successful, Sauzameda will be able to sponsor Hernandez for citizenship. "Today's results are another demonstration of the heartless nature of this system," Piper said. "Now that Arturo may be able to 'adjust' through his wife, Ana, he is expected to leave his family. Congress must create transparent and fair paths to status." Hernandez has another meeting scheduled with ICE officials on April 4. "He was told to come back with plans to deport from the country," Kowal said. "There's no reason for it."